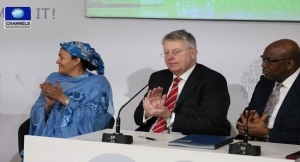 The chairmen of both organisations signed an agreement at the Paris climate talks on Wednesday. The new TV magazine called [email protected] will be jointly produced in Berlin and Lagos. It will focus on the particular challenges that environmental problems pose for Nigeria and Africa. 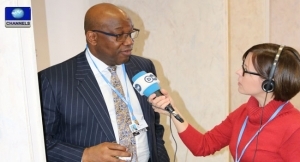 Channels TV chairman and Chief Executive Officer, Mr John Momoh, stressed the link between the two broadcasters, which had earlier signed an agreement to share programmes. For DW, Germany’s international broadcaster, the joint production of a TV magazine across continents is the first cooperation of this kind. 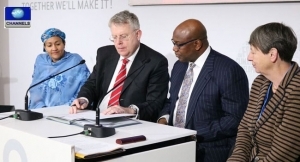 The chairman of DW, Mr Peter Limbourg, said: “This is the first real co-production with Africa. Produced in Lagos and Berlin and aired by Deutsche Welle and Channels TV, this is an important step for us because it is a real collaboration”. Also at the signing, which took place at the German Pavillion in Le Bourget, were Nigeria’s Minister of Environment, Amina Mohammed and the German Federal Environment Minister, Barbara Hendricks. 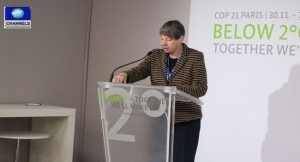 Mrs Hendricks hailed the cooperation, saying ‘it is an example of the joint national efforts that are required to combat global warming’. “Climate change challenges us all. We have to overcome this challenge together. And what could be better than deeper insights about each other. 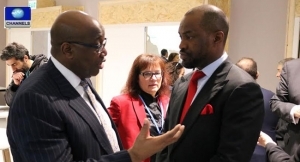 I am delighted about this new program by Deutsche Welle and Channels TV which showcases successful environmental projects,” Hendricks said at the event on the sidelines of the COP21 climate talks in Paris on Wednesday. Ms Mohammed, highlighted the role of the media as a vital communicator. “The media plays an incredibly important role in communicating information about collective environmental efforts. 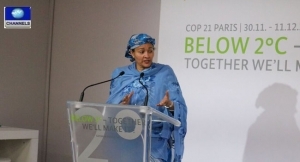 I am very happy about this new program, particularly as Africans are heavily threatened by climate change but they are also the least informed,” she said.